This is a quick card. The stamp is Stampendous-Ruffled Butterfly. The designer paper is from Disney (tinkerbell). The Large circle scallop is from a punch and I glittered the edges. 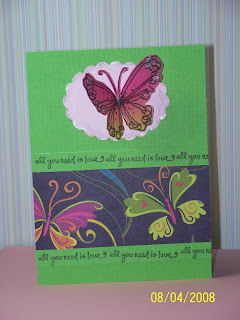 Butterfly was stamped on colored vellum with black versifine, then embossed with clear embossing powder. Cut it out and folded in half so he sticks out. Put together on a kelly green textured card made from Bazzill cardstock. Going to the fair on Friday with my sister. Our annual trek! Hope the weather is good, although I am loving the lower humidity.